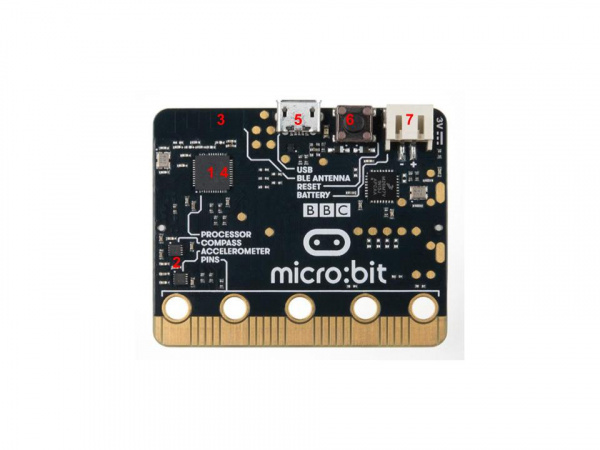 So you bought this thing called a micro:bit…what is it? 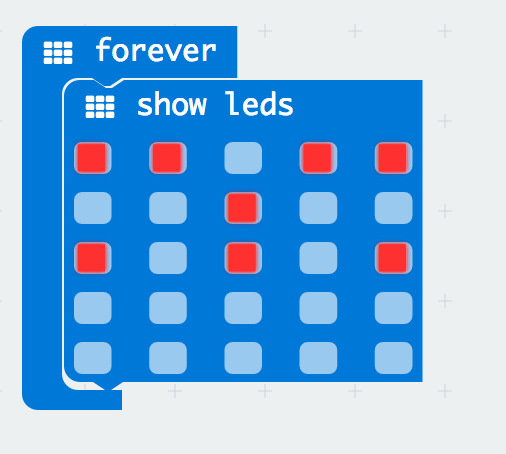 LED Array — The micro:bit has a 5x5 LED array that you can use as a tiny screen to draw on and display words, numbers and other information. A/B Buttons — Two buttons in all of their clicky glory: A is on the left, B is on the right, and both are prime for controlling a game of your design. Edge “Pins” — The gold tabs at the bottom of the board are for hooking up external components. The tabs with larger holes can be easily used with alligator clips to prototype things quickly! Light Sensor — A bit of a hidden gem. The LED array doubles as a light sensor! Phew! That is a lot of bells and whistles…a true Swiss army knife! Once you plug your board in, you should see the small yellow LED on the back of your micro:bit light up and possibly blink a few times. Then whatever existing program that was put on the micro:bit will start running. 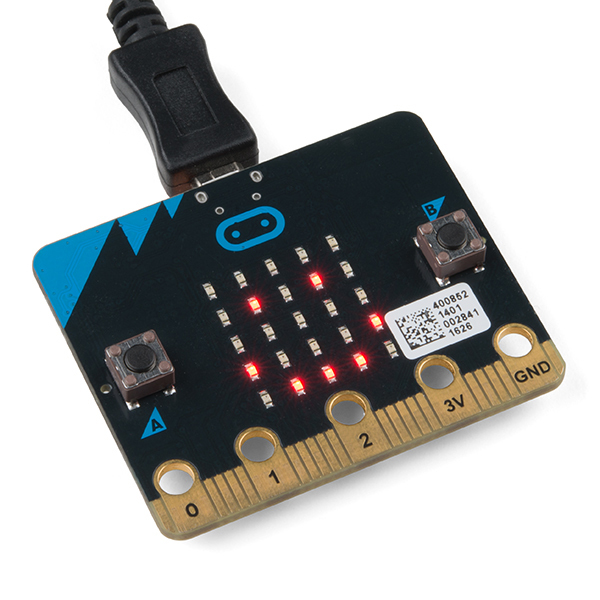 If this is your first time plugging your micro:bit in, go ahead and play around with it a bit — push buttons, shake it, and you will get a bit of an Easter egg. This guide and most of SparkFun’s content around the micro:bit will use MakeCode by Microsoft for programming. 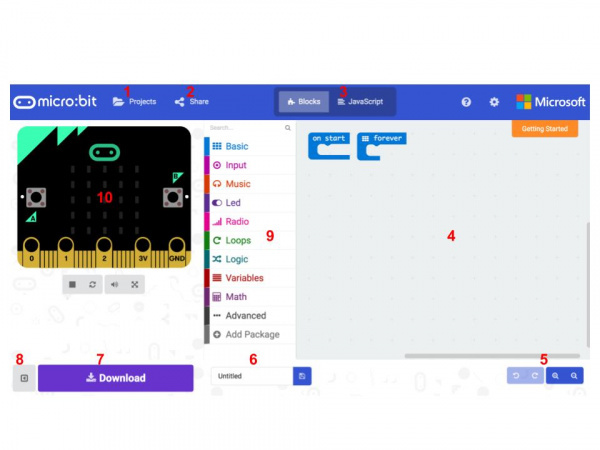 Once you have launched MakeCode, you will be greeted by its basic layout with a simulator on the left and a block-based environment on the right, as shown here. Let’s take a quick tour and check out what is available to us! Projects — A cloud storage system connected to your computer with no account setup required. Share — Allows you to share your project code in a number of different ways with your friends! Zoom/Undo-Redo — Sometimes you need to undo things, or zoom out and look around; these are the buttons for that. Name & Save — Name your program and save it (download it) to your computer. Download — Similar to Save, download your program as a .hex file and drag it into your micro:bit. Block Library — All of the options in terms of program building blocks, which are color-coded by function. Simulator Hide/Show — You can hide/show the simulator if you would like. Simulator — You don’t need hardware! MakeCode has a real-time simulator! 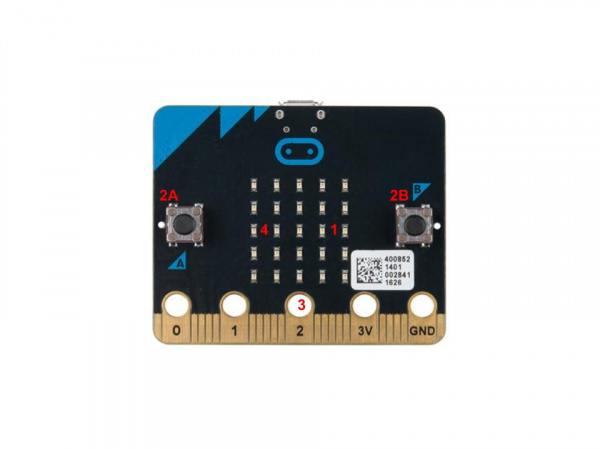 As you change your program, you can see what it will do on this virtual micro:bit! Phew! So, now you have a choice…blocks or text-based programming? MakeCode includes a simulator for the micro:bit, meaning if you don’t have your micro:bit in hand you can still write code for it. Or if you want to try out an idea before you upload it to your micro:bit, you can do that too! The simulator will update as you build your code, and if you want to run it from the beginning you can click the stop and run buttons to start it over again! Speaking of code…let’s write a quick program and get it onto your micro:bit! 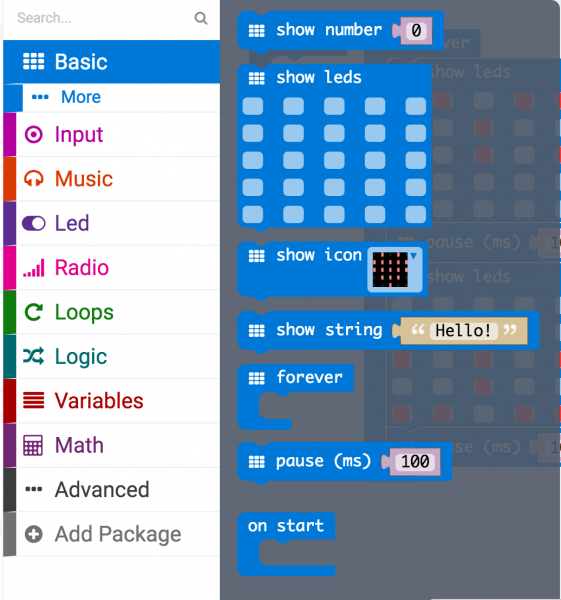 Now comes the good stuff — writing your first program for your micro:bit in the MakeCode programming environment! “Hello World” is the term we use to define that first program you write in a programming language or on a new piece of hardware. Essentially it is a simple piece of code that gives you a quick win (fingers crossed) and a first step in learning. It also gives you a chance to make sure everything is up and running and A-OK.
For your first “Hello World” we are going to create a simple animation on the LED array that repeats forever. If you just want the complete program you can see it here. To see a step-by-step explanation of how we built the program, continue reading! A “Hello World” on the micro:bit is a little different than on a normal run-of-the-mill microcontroller. The micro:bit has no single LED to blink on its own, as you would find on the Arduino or similar boards. 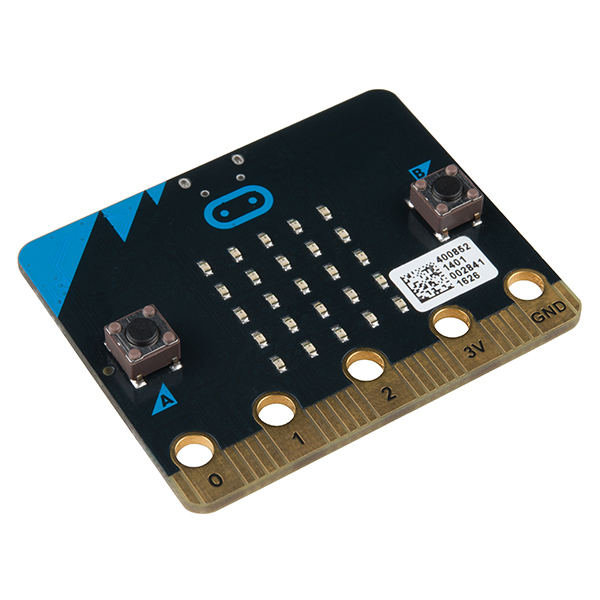 What the micro:bit does have is an LED array! 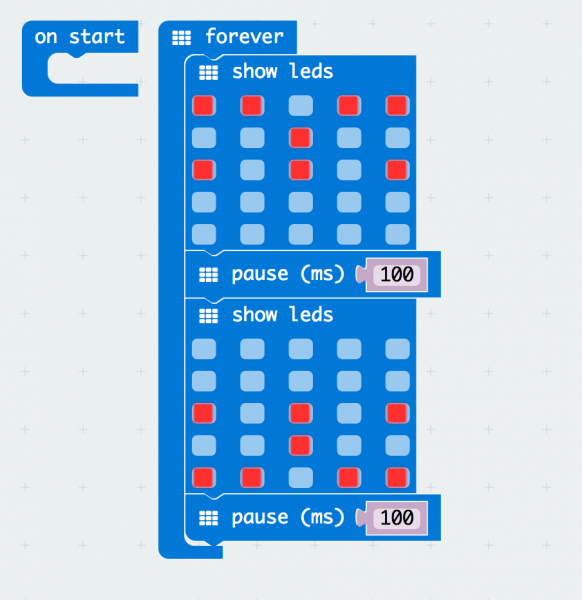 So, the “Hello World” for the micro:bit is to draw something using the LED array! When you open MakeCode you are greeted with two blocks: the On Start block and the forever block. The On Start block is all of your code that will execute at the very beginning of your program and only run once. 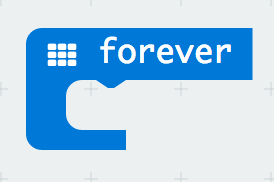 The forever block is code that will loop over and over again…forever. We are going to use the forever block for building this “Hello World.” We now need to start adding blocks to forever. First, click on the Basics category. These blocks are, well, the basic building blocks of a BuildCode program. It will expand into a number of options. Click and drag the show leds block over and place it inside of your foreverblock. Notice that the block is keyed to fit inside of the forever block, and if you have the volume up on your computer you will hear a satisfying ‘click’ noise when you let go of the block. The show leds block has an array of squares that symbolize the LED array. If you click on a square, it will turn red, which means that it is ‘on’. Draw a simple pixel art shape by turning different LEDs on or off; you should be able to see the outcome in your simulator on the lefthand side of your window. The reason we are using two and placing one at the end is that this program is a loop. Without the block at the end, the image in your animation will change really, really fast. 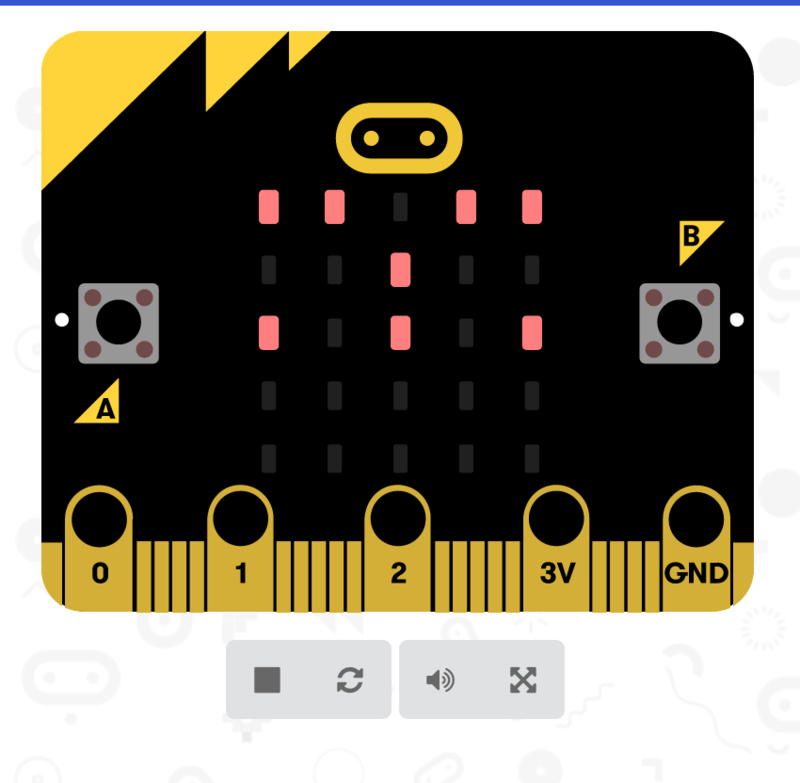 We have built up an example in the next section where you can download the file and try it out on your own micro:bit, or use the simulator. If you want to play around with the code and make some changes, go ahead and click the Edit button in the widget, and it will open a MakeCode editor for you to start hacking “Hello World.” Enjoy! So…you built your first program in MakeCode, and it works in your simulator. Now, how do you get it onto your micro:bit? Well, once you are happy with your program, you can click the Download button in MakeCode. 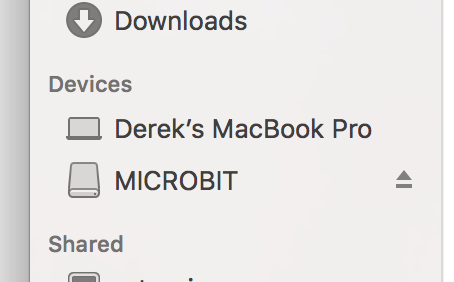 OK, now you have your program running on your micro:bit, but it is still tethered to your computer. There are a number of ways to solve this problem…batteries, batteries and more batteries! USB battery packs are becoming pretty commonplace out there. You can use one to run your micro:bit project for quite a long time. It is handy to have a shorter USB cable to keep from dragging a super-long wire around. The AAA battery pack is a great solution if you are looking to power a whole lot of micro:bits for a good amount of time, such as in a classroom setting. These batteries can be purchased in bulk for pretty cheap. Code Club Activities — 6 activities from Code Club to try out!